In sizes 13.5g, 19g, 21g and 28g, this Chrome Spoon, with a wobbling action is best retrieved at a slow to medium speed and will take perch, chub, pike and zander, as well as saltwater bass and mackerel. 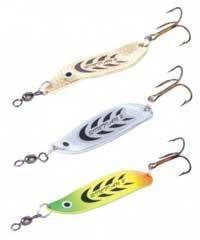 Slither Spoons are a proven lure for freshwater perch, pike and zander, also saltwater bass, mackerel, pollack, garfish, coalfish and cod. 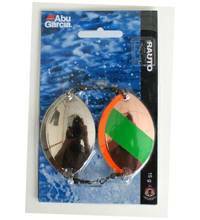 Aerodynamically designed for easy long range casting, and in highly reflective bright chrome finish or natural fish scale blue, it features an erratic side to side type action imitating a wounded fish. Available in sizes 21g, 28g and 42g.